It's the time of the year again when big brands gather in one huge venue to offer big discounts for all of us! 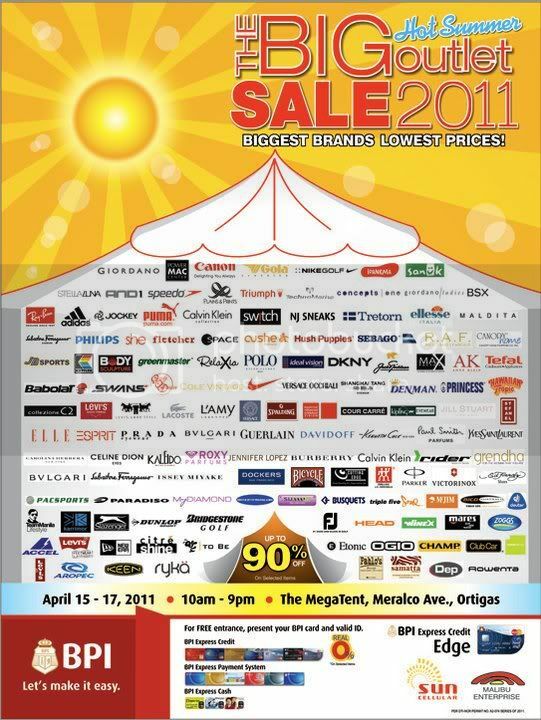 The Big Outlet Sale 2011 happens on April 15-17, 2011 at the Megatent in Meralco Avenue, Ortigas, Pasig City from 10am-9pm. FREE entrance to ALL BPI cardholders (credit cards and ATM alike) + additional perks for BPI Express Credit Edge cardholders. This event is brought to us by Malibu Enterprise, Sun Cellular and BPI Express Credit Edge. On the top-right side of my site, enter your email address to receive free updates, then click Subscribe. Comment below by leaving your Full Name and the E-mail Address you used to subscribe for free updates in #1. Additional 1 ticket will be given to those who will like GLICH'S LIFE on Facebook and post this on your Facebook Wall: "Like Glich's Life for a chance to score FREE TICKETS to The Big Outlet Sale 2011!" Make sure that your wall post is visible to Everyone. In addition, Glich's Life should link to the Facebook page. After posting, comment below with the link of your Facebook Wall Post, Full Name, and Email Address. This giveaway is open until all 100 tickets have been taken and only until 9AM of April 14, 2011. The names of successful commenters will be posted here around 12NN of same day as deadline. Thank you for everyone who joined. After verification of all entries, a few didn't qualify because they did not do #1. For everyone who made it, congratulations to you. I have already sent an e-mail on details. Happy shopping!